Insert the word “havarti” into any recipe name and you’ve got me! 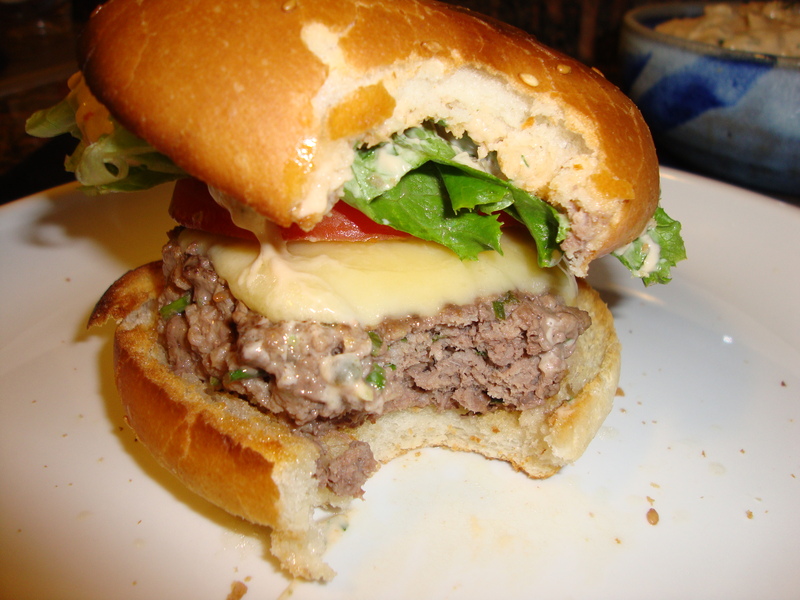 I loved these horseradish burgers courtesy of Guy Fieri’s “Food” cookbook… and not just because of the havarti. The horseradish was JUST enough to give the burger some zip (I hate it when horseradish is overpowering), the meat was moist and juicy, and the remoulade…well, you’ve got to try the remoulade. Let me say, to start, that I’m not a mayo fan. 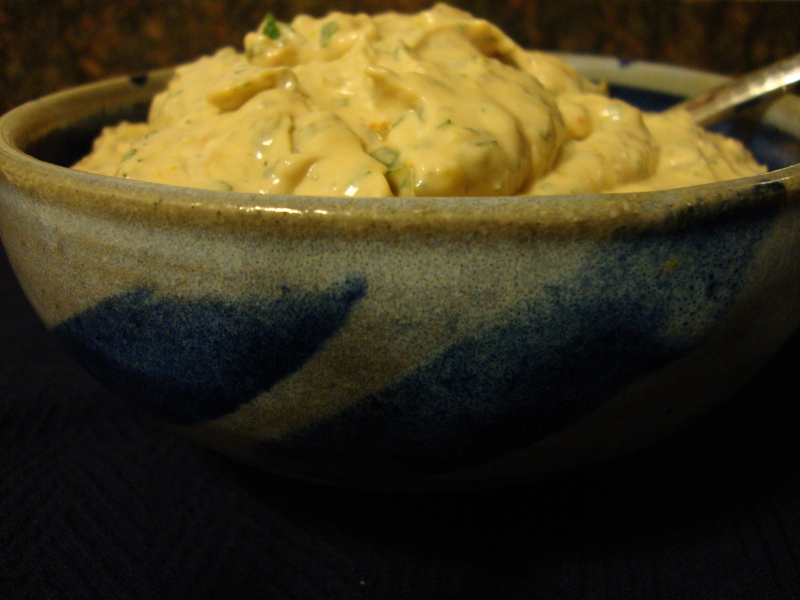 And remoulade is mostly mayo (which I didn’t know until I read the ingredients). However, the French know best, and if you pair mayo with a number of some of my favorite ingredients — namely dill pickles, capers, Dijon mustard, garlic, Tabasco and sea salt — you’ve got a delicious sauce that I was licking off my fingers as it oozed out from under the bun. Who knew? Overall, this was a really simple meal to make. Not too many ingredients to mix into the burgers, you just throw them on the grill or grill pan, mix up the remoulade, throw some sweet potato fries in the oven, and you’re good to go! 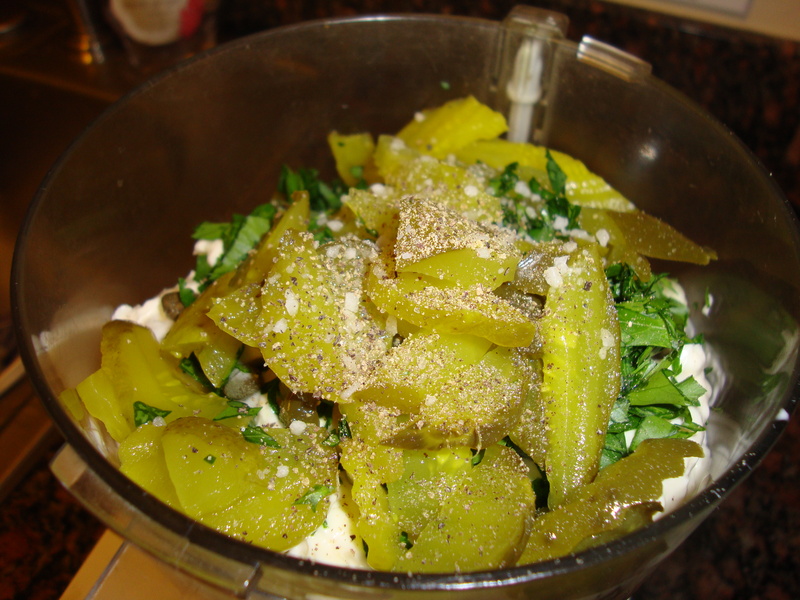 In a food processor, combine all the ingredients for the remoulade. Pulse a few times to combine. Cover the remoulade and pop it in the fridge while you make the burgers. Put the beef in a large mixing bowl. Use a rubber spatula to fold in the horseradish and chives; season with salt and pepper. 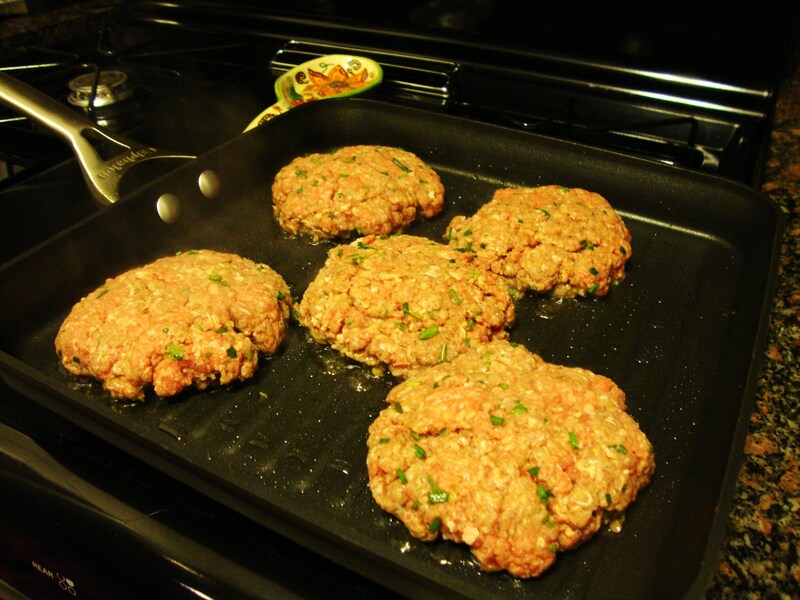 Hand-form the meat into 8 burgers, cover them, and set them aside in the fridge while you prepare your grill. Preheat a gas or charcoal grill and get it very hot. Burgers stick to a cold grill, so it’s important that you give the grill plenty of time to heat. Here is a restaurant tip to keep food from sticking to your grill: Take a few paper towels and fold them several times to make a thick square. Blot a small amount of oil on the paper towel; then carefully and quickly wipe the hot grates of the grill. This will create a nonstick grilling surface. Grill the burgers for 8 minutes per side for medium; 7 minutes if you like your meat rare. If you like well done, I can’t help you. When the burgers are just about cooked, put a couple of slices of cheese on top of each and cover the grill for 1 minute to melt the cheese. Remove the burgers to a clean side plate so you have enough room to toast the buns. Rub the grill rack with the same paper towel as before to clean off the small charred pieces; then toast the hamburger buns cut side down for 1 minute. 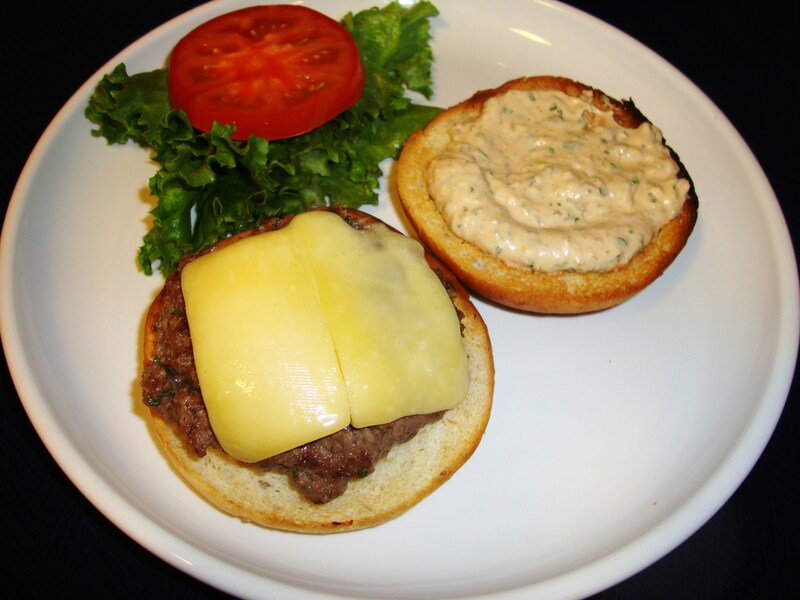 Serve the burgers with the tomato remoulade and any garnish you like, such as bacon, lettuce, sliced tomato, or onion. 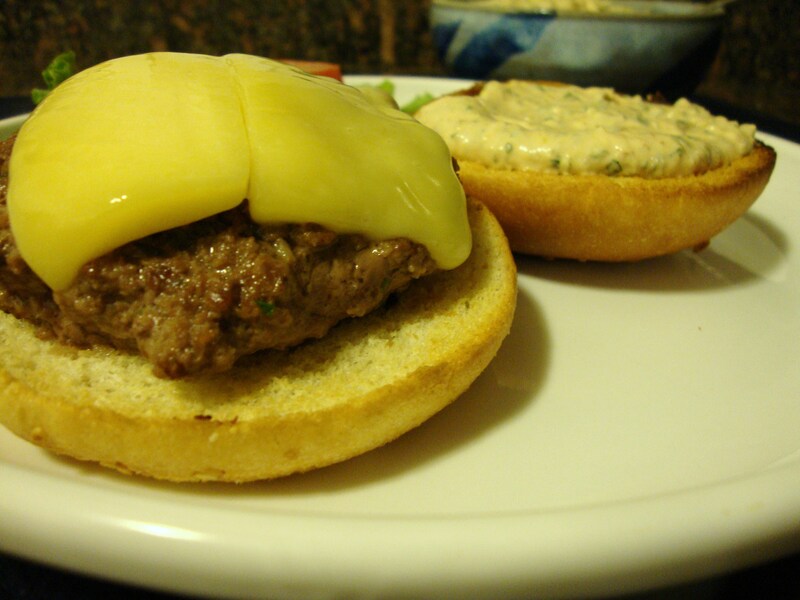 This entry was posted in Recipes, Uncategorized and tagged burger, Guy Fieri, horseradish, remoulade by Tricia. Bookmark the permalink.